Rainbow Limos has a very long experience in private transfer services. Amalfi coast (Positano, Amalfi and Ravello) and Sorrento are beautiful places but they have a very narrow and windy roads! That's why you need a private driver/guide who will drive you to our coast without any worry. A driver from our company will meet you at exit gates of the airport or at the end of the tracks into the train station and will help you to carry the luggage. Regarding the driving we promise a five stars limousine service which is completely different from a simple transportation and during the transfer we'll be totally at your disposal for support and questions. For clients who need transfers to Positano or Sorrento from different places than Naples as Rome airport and Salerno train station, we can drive you to our coast also from these areas. Obviously, we would be able to offer you also door to door transfer services from/to hotels, private villas or apartments anywhere you require. The closest airport and train station to the Amalfi coast are located in Naples; so, if you are wondering how to get from Naples to Positano and Sorrento or anywhere along our area we have your answer! We organize mostly private transfers from Naples airport and train station to Sorrento and Positano or also to Amalfi and Ravello. Are you getting into Naples via train or flight? Deciding to have sigthseeings during the transfers, as our company suggest, it could be the best way to optimize time and save money getting two services in one trip! No worries! Even if you are traveling with a lot of luggage, our driver will take care of them during the visiting time. A good option for clients who desire visiting the Ruins of Pompeii is to have a stop for a tour during the transfer from Naples to Positano, as the archaeological site is located halfway between Naples and Amalfi Coast. Our driver will drop you off right in front of the ruins entrace, then he will take care of your luggage, parking the car in a safe place. In Pompeii we recommend to spend about 2.5 hours to explore the ancient Roman town that was mostly destroyed and buried under meters of volcanic ash during the eruption of Mount Vesuvius in AD 79. Here, you will have the chance to walk around by yourself, learning more with the help of the audio-guide or a licensed private guide that we would be able to book on your behalf in order to maximize your limited time: the English speaking tour guide will show you around through the highlights of the site. At the end of your visit, we will continue the trip to reach your destination. A good option for clients who desire visiting the Ruins of Herculaneum is to stop there for a tour during a transfer from/to Naples, as the archaeological site is located between Naples and Amalfi Coast. Our driver will drop you off right in front of the ruins entrace, then he will take care of your luggage parking the car in a safe place. 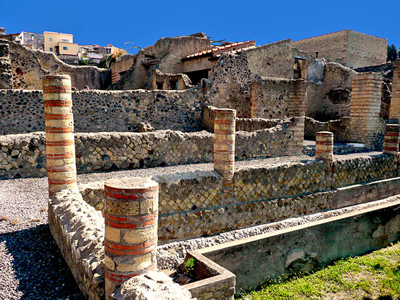 In Herculaneum we recommend to spend about 1.5 hours to explore the ancient Roman town that was destroyed by volcanic pyroclastic flows during the biggest eruption of Mount Vesuvius in AD 79. Herculaneum, unlike Pompeii, was a smaller but wealthier town, possessing an extraordinary density of fine houses; the deep pyroclastic material which covered it preserved the beauties of the ancient town very well, along with lots of wooden and other organic-based objects (such us roofs, beds, doors, food and even some skeletons discovered in recent years). Here, you will have the chance to walk around by yourself, learning more with the help of the audio-guide or a licensed private guide that we would be able to book on your behalf in order to maximize your limited time: the English speaking tour guide will show you around through the highlights of the site. At the end of your visit, we will continue the trip to reach your destination. 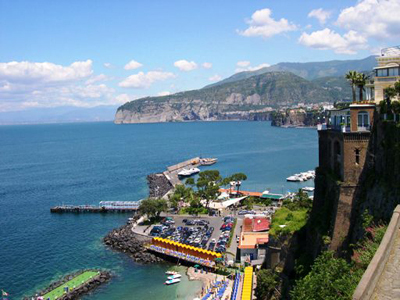 A good option for clients who desire visiting Sorrento is to stop there for a tour during a transfer from/to Naples, as the lovely town is located between Naples and Amalfi Coast. Our driver will drop you off by the main square, then he will take care of your luggage parking the car in a safe place. In Sorrento we recommend to spend about 1.5 hours to enjoy the stunning panorama of the Bay of Naples but also parks, villas, lemon gardens and inlaid wood factories, walking through the picturesque narrow streets full of typical stores which will make you crazy for shopping! Here, you will have also the chance to appreciate the historical side of the town, visiting the Cathedral of St. Filippo and Giacomo, the Cloister of St. Francesco d'Assisi Church or the Correale Museum which contains Roman & Greek exhibits, valuable painters, ceramics and Murano glasses. At the end of your visit, we will continue the trip to reach your destination. A good option for clients who desire visiting the Amalfi Coast is to have a tour during a transfer from/to Naples, as we can drive through the coast before reaching your destination. Our driver will stop you by the city centres of the most popular villages, allowing time for a visit while he will take care of your luggage parking the car in a safe place. 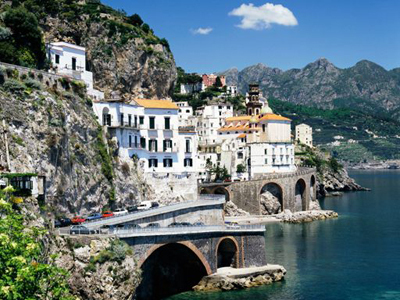 There will be enough time for taking nice pictures along the scenic route of the popular "Amalfi-drive" as well. In Positano you will have free time to explore the centre walking down to the beach, through the picturesque streets full of stores that mostly sell typical hand-made products such as clothes, sandals and finely painted ceramics. You should not miss the Church of St. Maria Assunta with its majolica tiled dome which can be seen from every corner of the village. In the seaside town of Amalfi there will be time to take a look at the wonderful Cathedral of St. Andrew and walking through the little lively alleyways having a nice gelato or a good espresso! In Ravello instead, you will appreciate the stunning views, surrounded by the popular gardens of Villa Rufolo and Villa Cimbrone. The last one, which include the famous "Terrace of Infinity" overlooking all the coast from above, must be visited at least once in your life! At the end of the tour, we will continue the trip to reach your destination. 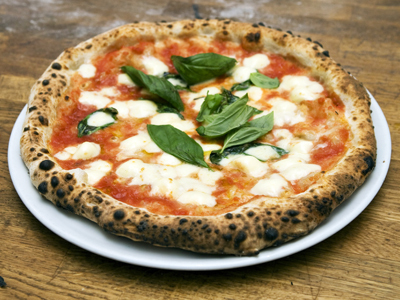 If you are arriving in Naples, you can't miss the chance to taste the local authentic Neapolitan Pizza! Our driver, after picking you up at the airport or train station, will take you to a very good pizza place depending on your preferences; he will drop you off right in front of the entrace, then he will take care of your luggage waiting in the car for all the time you will need. We recommend to spend about 1 hour to enjoy and taste the real Pizza made in Naples which has its origins way back in the eighteenth century: people of Naples started to combine a soft and elastic dough with local ingredients such as fresh tomatoes, mozzarella, basil and extra-virgin olive oil. The result of this is the famous "Pizza Margherita", named after Margherita of Savoy - Queen of Italy, and voted for its colours to represents the Italian flag (green, white and red). At the end of your lunch/break, we will continue the trip to reach your destination. Of course, this option would be available also if you are leaving from Naples, taking the reverse route.